My wife and I (and sometimes others) have felt called to carry a red, yellow, and blue flag on the streets of Nashville for the past 7 years. It is the official flag of The Salvation Army: The red represents the blood of Jesus; the yellow stands for the fire of the Holy Spirit; and the blue reminds us that we are called to follow and obey the living, resurrected Jesus Christ in our daily lives. 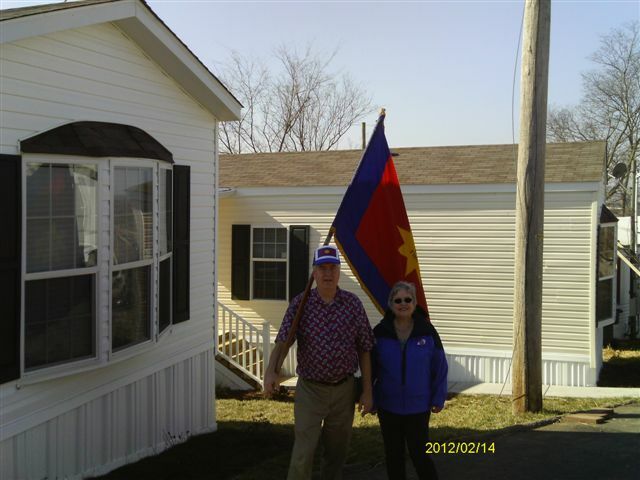 We recently carried the flag a couple of miles up Dickerson Road to Jodi and Loretta’s newly purchased mobile home. (They are a regular part of The Salvation Army Berry Street Worship Center and were homeless 4 years ago.) We prayed and dedicated their new home to God. Then Rufus yelled at us and he and Scott walked across busy Dickerson Road. Rufus worked as a bell ringer for us one Christmas season. Rufus told us that Scott was homeless and wanted to change his life. We got to encourage both of them, pray with them, and give Scott some leads for recovery and housing. He, also, said he would come visit Berry Street. Several people honked and waved at us along the way. And a few people asked us about the flag. It was a real adventure! This entry was posted in blood, Blood and Fire, blood of Jesus, Christian flag, corps, creativity, Dickerson Road, fire, fire of the Holy Spirit, flag, innovation, Music City, Nashville adventure, Nashville charity, Nashville events, Nashville housing, Nashville streets, New York, prayer, prayer walking, praying, red flag, Salvation Army church, Salvation Army Corps, Salvationists, The Salvation Army, The Salvation Flag, what to do in Nashville, yellow and blue and tagged divine encounters, homeless, Nashville. Bookmark the permalink.